#Office365Challenge As you know with Office 365 you have access to the latest versions / updates. This post will show you how to check which version you’re on and choose to update it. 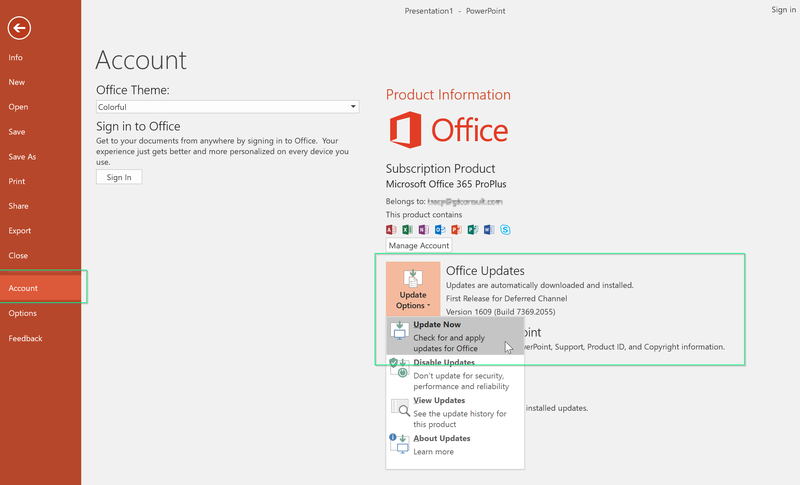 You can check your version of Office in any of the applications you use. In my example I checked it in PowerPoint. Keep in mind that this is reliant on your company’s strategy around updates. Are they first release tenants? See my post around release preferences. Here is an Overview of update channels for Office 365 ProPlus as well as the Office 365 client update channel releases. Another great post is What’s new and improved in Office 2016 for Office 365 which shows all updates since September 2015.